Sweet potato weevil Cylas formicarius (Fabricius) is the most serious pest of sweet potato, not only in the United States, but around the world. It causes damage in the field, in storage, and is of quarantine significance. It is inherently of interest to entomologists due to its strikingly colourful appearance and extremely long rostrum (beak). 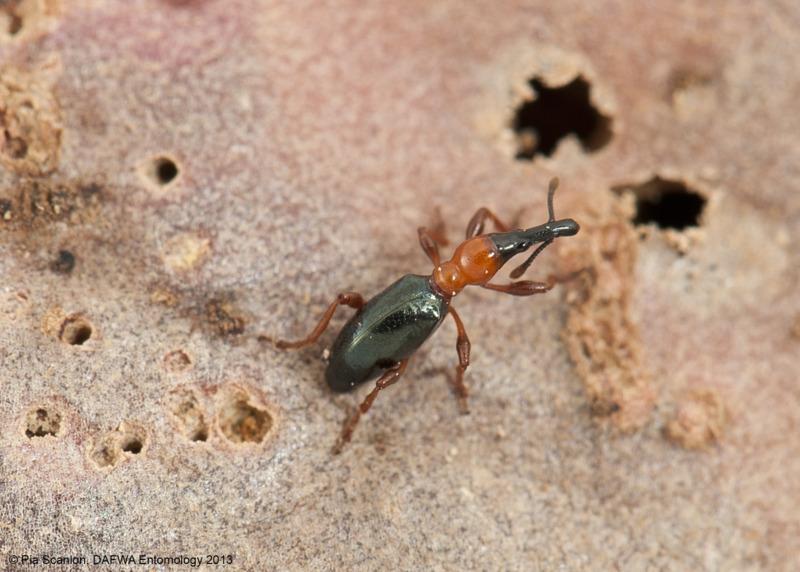 The adult body, legs, and head are long and thin, giving it an ant-like appearance. The head is black, the antennae, thorax and legs orange to reddish brown, and the abdomen and elytra are metallic blue. It measures 5.5 to 8.0mm in length. A complete life cycle requires one to two months, with 35 to 40 days being common during the summer months. Adults do not undergo a period of diapause in the winter, but seek shelter and remain inactive until the weather is favourable. All stages can be found throughout the year if suitable host material is available. This weevil feeds on plants in the plant family Convolvulaceae. Among vegetable crops only sweet potato (Ipomoea batatas) is a suitable host. Some native plants can also be hosts, including railroad vine (Ipomoea pes-caprae), and morning glory (Ipomoea panduratea). Sweetpotato weevil is found widely around the world in tropical regions. In Australia this pest is found only in Queensland where it is widespread. Sweetpotato weevil is considered to be the most serious pest of sweet potato, with reports of losses ranging from five to 97% in areas where the weevil occurs. A symptom of infestation by sweetpotato weevil is yellowing of the vines, but a heavy infestation is usually necessary before this is apparent. Infestation is easily overlooked, as damage is not apparent until tubers are harvested. The principal form of damage to sweet potato is mining of the tubers by larvae. The infested tuber is often riddled with cavities, spongy in appearance, and dark in colour. The adult may feed on the tubers, creating numerous small holes that measure about the length of its head.